Yesterday, for the first time in a few weeks, I did not need to wear a jacket in Nashville. It's glorious outside! We had one splendid weekend in March that, as it did for many people in the U.S., preceded weeks of cold, rain, snow, and lots of gloomy days. As an office-dweller, days like today and yesterday make me burst through our storm door as soon as I get on a pair of jeans and put some breakfast in my belly. Lately, especially, I've wanted nothing more than to get away to clear my head. Yesterday I went out alone with the intention of finding a solution for squirrels eating my bulbs, but it was too pretty a day to spend shopping. (I reconcile my occasional joy-riding with how little I drive during the week.) I headed north up Briley Parkway, then exited to the northwest, taking a couple turns to get further into the countryside. I stopped at a BP for water before turning around in Springfield, and I walked into what turned out to be both a convenience store and a restaurant, Douglas & Co. A man was sitting by himself enjoying one of the most tender-looking slabs of barbeque I've seen in a long while, and the smell! I could not miss out on it. The man, it turned out, was eating short ribs, so I took some of my own in a carryout container to share with my husband. Those ribs spent twenty minutes overwhelming my senses on the drive home, and they did not disappoint. No sauce needed here, folks. Today, my husband agreed to go south with me to do some exploring, but some miscommunication on both our parts resulted in us driving past dozens of cash advance stores, pawn shops, tobacco outlets, and cell phone stores. These are the shops that thrive in small towns all over the country, not just here in the south. It is one of the reasons I wanted to spread business education, so independent businesses could afford to open up their shops alongside the chains and franchises and create areas with local character. We turned around in Smyrna and returned home, content to spend more outside time on our porch. I'm inspired today and happy, ready for a spring of renewal. Below is a pic of our crocus. We have a deck instead of a yard, so we grow container plants. I planted four types of bulbs to give us blooms all through the season. 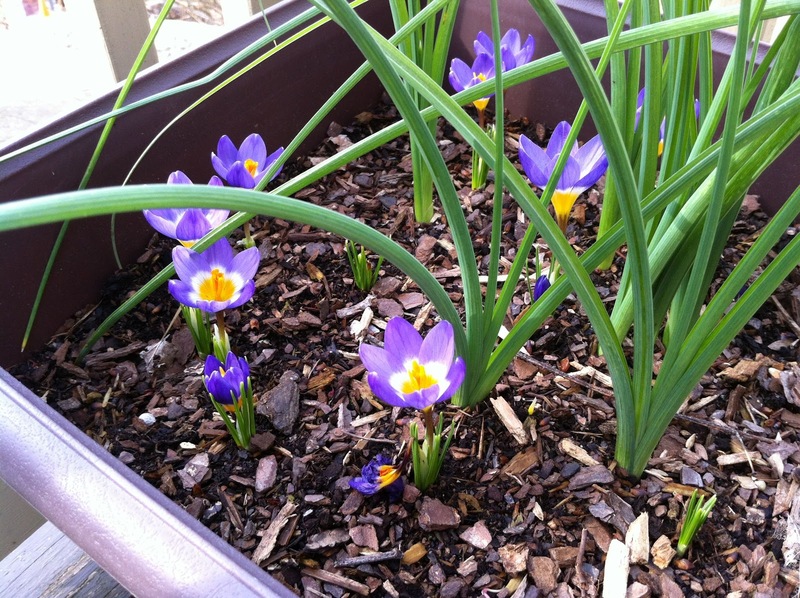 The crocus bloomed first, and some Checquered Fritillaria are just beginning to pop up. When the latter bloom, the petals will be purple with pink checks on them. It's not out of a lack of creativity that I get sentimental at spring time; the way more and more things seem to be falling into place, I just wanted to share a little optimism with all of you and wish for you some positive changes, too.